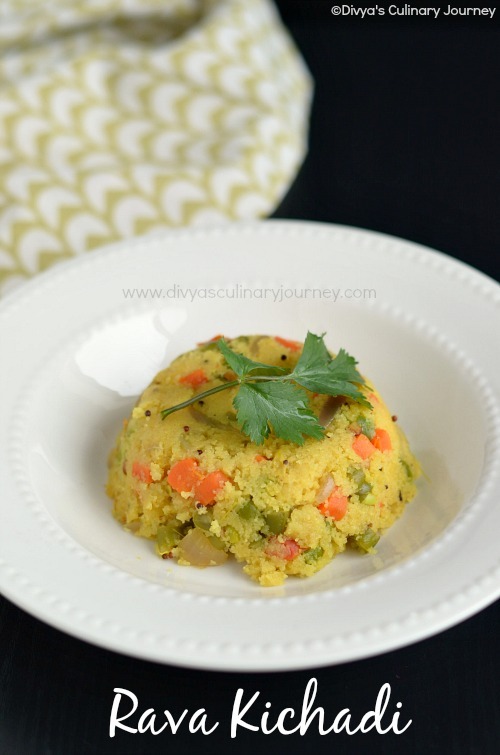 Rava Kichadi is a traditional South Indian Tiffin. It is made of Sooji/ semolina and has loads of vegetables. Rava Kichadi is one of my favorite. 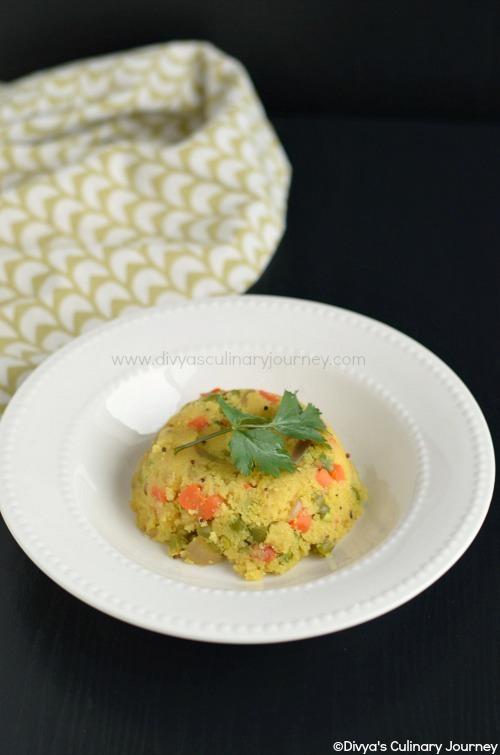 Even my hubby who is not a fan of Rava upma eats Rava kichadi without any complaints. 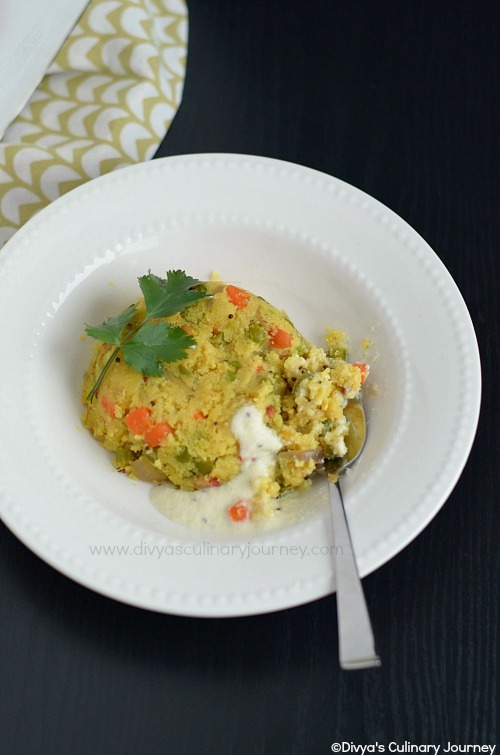 What makes the difference between the upma and the kichadi is the addition of tomatoes, veggies, turmeric, ginger and ghee in the kichadi. 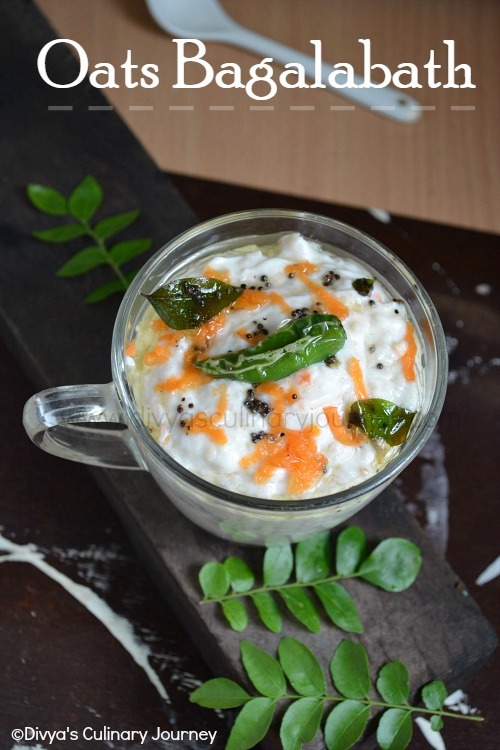 I usually serve this Kichadi with coconut chutney. You can also serve it with sambar or you can eat it with pickle too. One of my friend likes to eat this kichadi with yogurt. Each has different preference right? But they cannot say no to this melt in the mouth yummy rava kichadi. In a pan, heat a table spoon of ghee and fry cashew nuts and set it aside. Then in the same pan, in low flame, roast rava till nice aroma comes but don't let it change color. Then keep it aside. Then heat oil in a pan in medium-high flame, add mustard seeds, then add channa dal and urad dal and fry for a minute then add chopped onions, slit green chillies and curry leaves and fry till onions turn translucent. Now add grated ginger, chopped tomatoes, turmeric and cook till the tomatoes turn mushy. Then add the chopped vegetables and little salt (just as required for the vegetables) and reduce the heat to low and cover and cook till the veggies are almost done. Then increase the heat to medium high and add the required water and required salt and bring it to boil. Once the water starts boiling, then reduce the heat to low and slowly add roasted rava and keep stirring such that to avoid lumps. Keep mixing till all the water is absorbed and the rava is cooked. Turn off the heat and keep it covered for few minutes. Then add a tablespoon of ghee and the fried cashew nuts mix well and garnish with cilantro and serve with side dish of your choice. 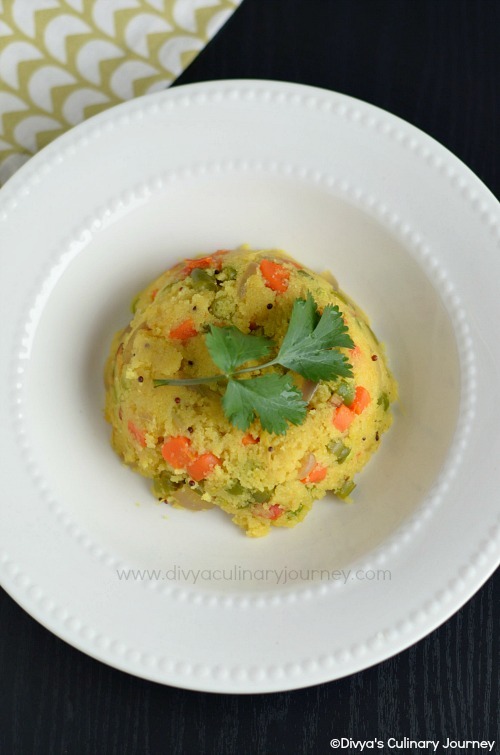 I usually add carrot, beans and peas to kichadi, you can also add potatoes or other vegetables of your choice. You can adjust the ratio as per your preference. You can boil vegetables and then add after step 3 and proceed to step 5, skipping step 4. As you are preparing , you can boil water in the side and add in step 5.This will speed up the process. Sometimes depending on the rava, it may require more water to get cooked, so keep a cup of hot water handy and you can add it, if required. While adding the roasted rava to the boiling water, it will sputter, so reduce the heat and handle it with care. If you are health conscious or looking to make it vegan, then you can skip ghee and fried cashews. But otherwise ghee adds to the taste of the kichadi and I recommend using it. delicious and filling breakfast.. love it!! My all time favourite breakfast, love with coconut chutney.